At this moment we have never been more proud to call you home, and our fellow Vancouverites our neighbours. You sure took a beating last night from a group of young people that are bored with life and were just looking for an excuse to cause trouble. We're sorry. We're sorry the world saw a image of "Vancouverites" that was the furthest from the truth. We're sorry that people around the world were given a reason to think that you may not be the incredible place to live that you are. It was devastating to watch you get torn apart, for no reason at all. But through the darkness the true heart of our city shone through. Brave police kept us safe and reminded us that good overcomes bad. Hundreds of kind-hearted volunteers helped clean you up today. Thousands and thousands have joined together to shake off this great sadness and celebrate why this city is amazing. Hopefully the world is still watching, because THIS is Vancouver. This is our city. This is our home. Vancouver, we love you. Leave a comment about what you love about our city…. What a great post, certainly what we need today. I love Vancouver!! 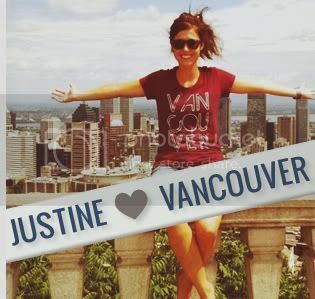 I love Vancouver because it inspires people to come together for great reasons. The city and the people in it are beautiful and our spirit will not be beaten down by a small percentage of goofballs who want to ruin it for everyone. Get over it. Yeah a couple of idiots did some damage. Oh well, it happens. I'm pretty sure it would have happened anywhere else people are so fanatical about a sport. And by the way, it's pretty silly to personify a city and to write a letter to it. If you loved it so much maybe you would be selling the t-shirts to its citizens for a bt less that $25!! If you loved it so much maybe you would have stepped in when people where rioting. If you loved it so much maybe you would have been actually WATCHING the game instead of messing around on the street cheering for no reason and not even knowing the score. If you loved it so much maybe you would donate to the businesses damaged and help the people hurt instead of writing meaningless phrases on the wood covering the windows and feeding your own hubris and making yourself feel better. If you loved it so much maybe you would wanna make it something better than a hippy boring town. But you don;t love it, its just a City, jeez get over it, people don't even write a letter to Santa Clause anymore let alone the place where they live. Grow up and stop trying to feel cool and like you have done something, you haven't. and I second Anonymous (ver 11:13). Well said. Thanks Anonymous (ver 11:13) finally someone who has got off there high horse and is sensing the realism and narcissism of this sillyness! Anonymous (11:13)… since the only comment you made that was written directly about our project was regarding our shirt pricing, thought we'd just take a moment to let you know our shirts are printed on American Apparel with 10% of every sale going to Covenant House to assist them helping youth living on Vancouver's streets. As you may know, American Apparel clothing is made in the USA and not overseas by under paid workers that are usually young children, so it's a bit pricier than other shirts we could have used. 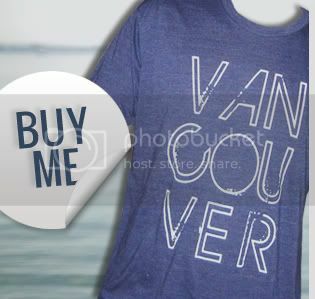 Since the same shirt, blank, sells in AA stores for $25, we think that it's a pretty fair price and allows us to give back a decent amount to Covenant House and cover our costs. 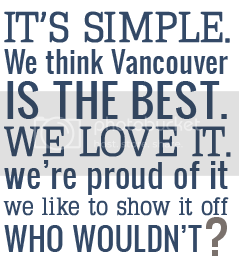 As for everything else you commented on… you're free to voice your opinion, positive or negative about Vancouverite's reactions to everything that happened this week. Thanks for taking time to check out our site!